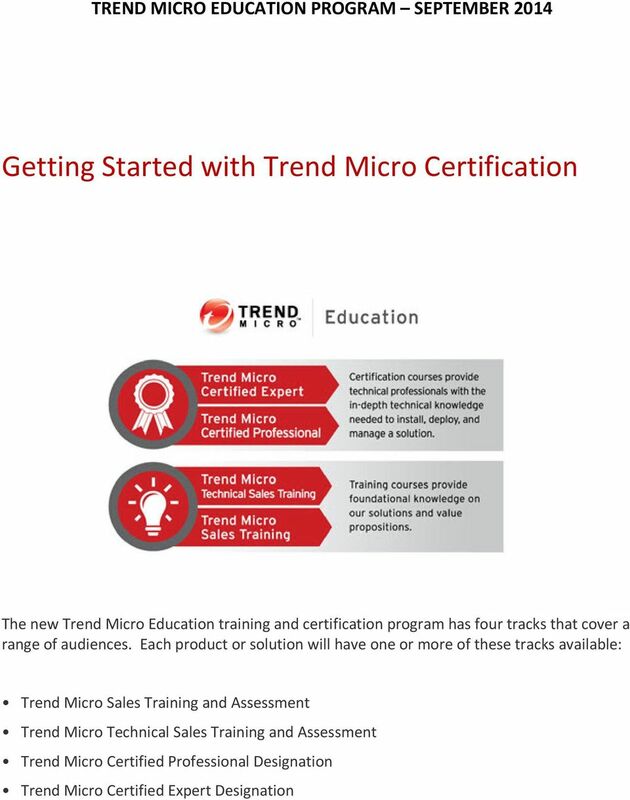 Download "Getting Started with Trend Micro Certification"
2 The Trend Micro Sales Training and Assessment enables sales consultants to validate that they have the requisite knowledge of Trend Micro products and technology basics necessary to complete sales activities with customers. Qualified candidates should be able to understand the competitive environment, their customers business challenges, and articulate appropriate solutions based on their customers needs and requirements. They should coordinate with technical staff throughout the sales process and utilize proper customer satisfaction techniques. The Trend Micro Technical Sales Training and Assessment enables sales consultants to validate that they have the requisite technical understanding of Trend Micro products, and the ability to explain their functions to customers. Qualified candidates should be able to conduct technical product discussions with customers, translate customer technical requirements into solution recommendations and assist customers with any technical questions. The Trend Micro Certified Professional Designation is intended for consultants who work with Trend Micro product solutions in enterprise environments. Successful candidates demonstrate the knowledge necessary to successfully install, deploy, scale, and manage a product, along with a solid foundation in basic concepts including public/private/hybrid clouds, multi-tenancy, and cloud security. 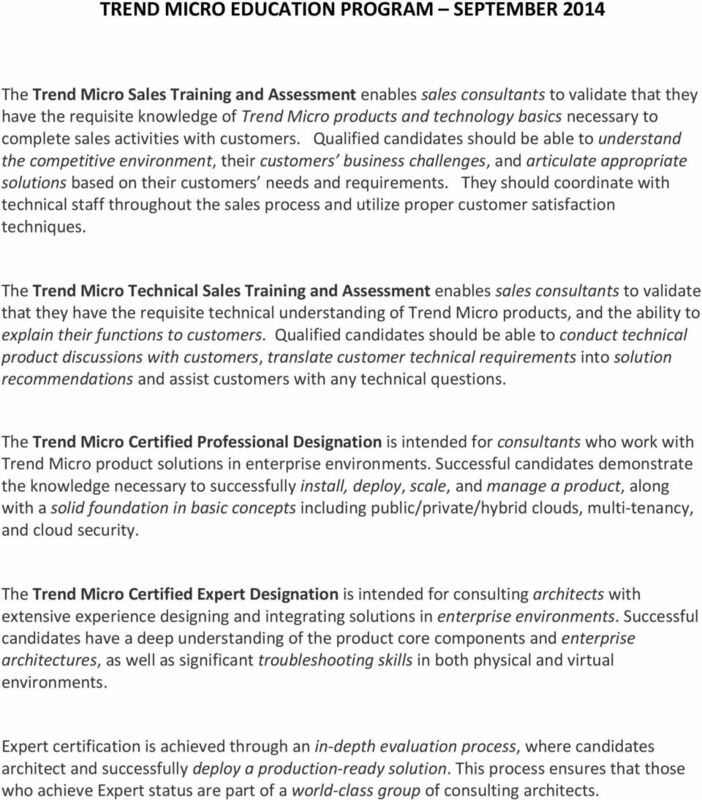 The Trend Micro Certified Expert Designation is intended for consulting architects with extensive experience designing and integrating solutions in enterprise environments. Successful candidates have a deep understanding of the product core components and enterprise architectures, as well as significant troubleshooting skills in both physical and virtual environments. Expert certification is achieved through an in-depth evaluation process, where candidates architect and successfully deploy a production-ready solution. This process ensures that those who achieve Expert status are part of a world-class group of consulting architects. 3 Courses available on the training site: Training Technical Sales Specialization Trend Micro Product Sales Training Training Small Business Security Worry-Free Business Security Hosted Security Certified Professional Certification Certified Expert Complete User Protection (CUP) Solution Overview Control Manager Endpoint Endpoint Application Control OfficeScan Worry-Free Business Security Vulnerability Protection Mail and Collaboration Gateway InterScan Messaging Security PortalProtect Hosted Security ScanMail for Microsoft Exchange Web Gateway InterScan Web Security as a Service InterScan Web Security Virtual Appliance Mobility Mobile Security SafeSync for Enterprise Cloud and Data Center Security Deep Security SecureCloud ServerProtect Custom Defense Deep Discovery Each course has a number of content assets available to students: Video Product datasheets Competition datasheets Training documents How to documents Admin Guide Installation Guide Etc. 4 Users will retain their current certification records in the new Education Portal. In addition, we have defined a mapping between the previous certifications and the new program, and will be automatically giving you credit for the equivalent track in the new program. 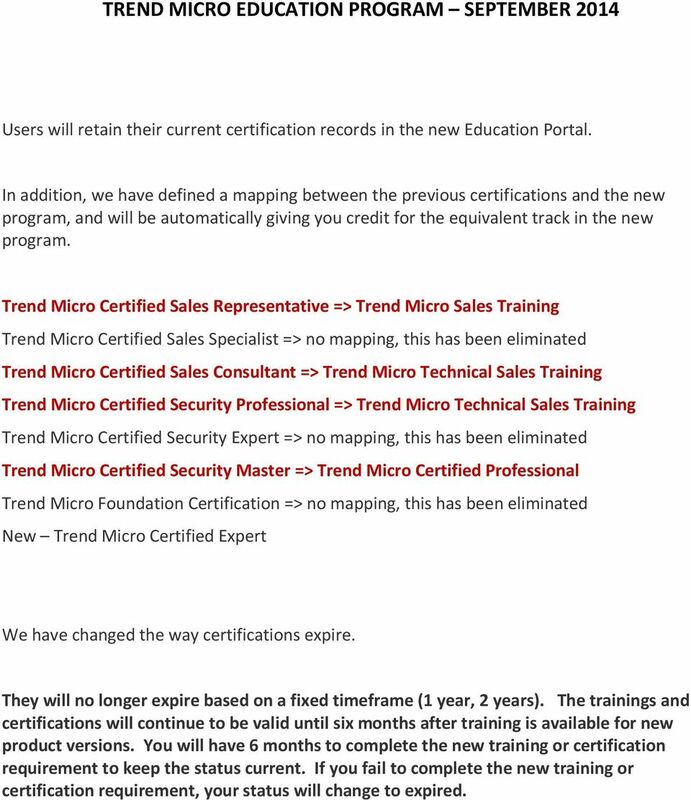 Trend Micro Certified Sales Representative => Trend Micro Sales Training Trend Micro Certified Sales Specialist => no mapping, this has been eliminated Trend Micro Certified Sales Consultant => Trend Micro Technical Sales Training Trend Micro Certified Security Professional => Trend Micro Technical Sales Training Trend Micro Certified Security Expert => no mapping, this has been eliminated Trend Micro Certified Security Master => Trend Micro Certified Professional Trend Micro Foundation Certification => no mapping, this has been eliminated New Trend Micro Certified Expert We have changed the way certifications expire. They will no longer expire based on a fixed timeframe (1 year, 2 years). The trainings and certifications will continue to be valid until six months after training is available for new product versions. You will have 6 months to complete the new training or certification requirement to keep the status current. If you fail to complete the new training or certification requirement, your status will change to expired. 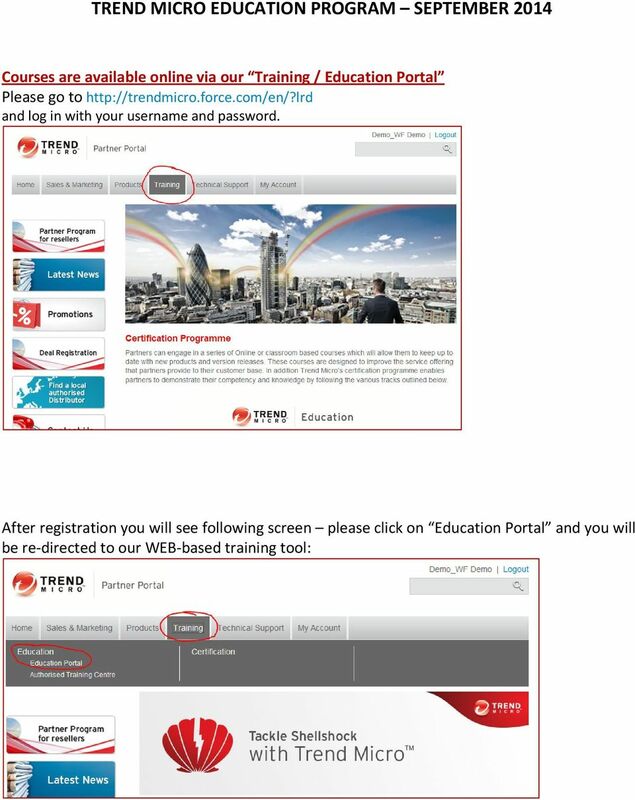 6 Education Portal, please enter Self-Paced and select one of the modules to get started: Within the module, i.e. 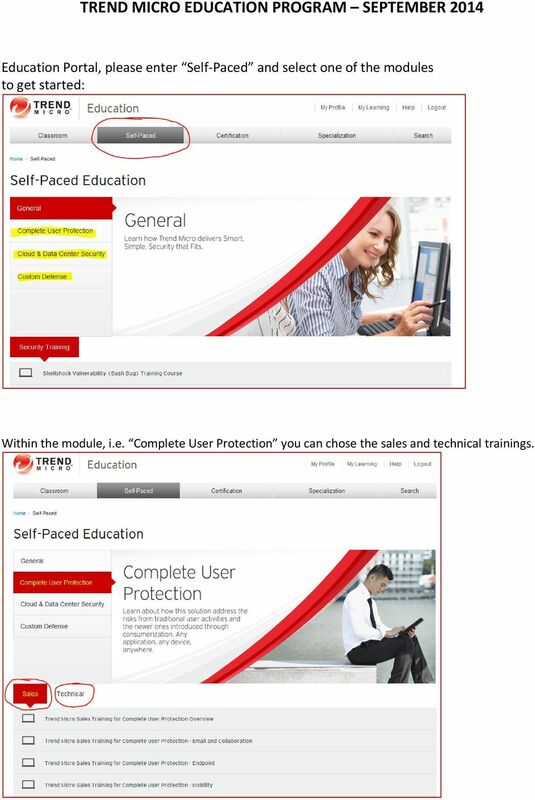 Complete User Protection you can chose the sales and technical trainings. Self- Paced Training Guide: You will need to have access to a QuickBooks Online Accountant (QBOA) dashboard before completing the course (if you already have access then you can refer to the link below). Cisco Certification Skills Matrix Whatever skills you need, IT networking professionals with Cisco Certifications have more to offer. Use this matrix to help evaluate candidates and make the perfect hire. For additional information and evaluation copies of Trend Micro products and services, visit our website at www.trendmicro.com. In addition, the PCVE exam will validate the individual s knowledge of networking models, standards and protocols relevant to videoconferencing. Endpoint Security: Become Aware of Virtual Desktop Infrastructures!